Google Hangouts is a secure video conferencing service that is HIPAA compliant. Google Hangouts works with almost every kind of device. You can download apps for every major browser. 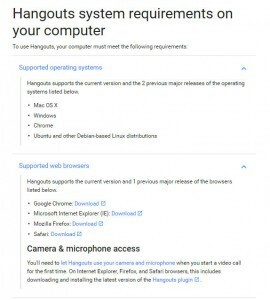 Click on the Hangouts system requirements for your computer on the illustration to the right to find out more information and to get links to download the apps for your computer and web browser. Or you can find that and more information by going to Google Hangouts Help for information about almost every aspect of using Hangouts. If you are using an iPhone download the app from the App Store. If you have an android phone go to Google Play. If you have a Mac you may need to install Google Chrome as a browser and then install the plug in or there are stand alone apps that are compatible with Hangouts such as Chatty for Hangouts. There are three ways of using Google Hangouts. 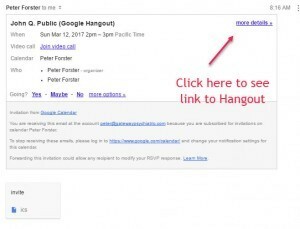 You may be able to get there by logging into hangouts.google.com but this may involve some setup. You’ll need to let Hangouts use your camera and microphone when you start a video call for the first time. On Internet Explorer, Firefox, and Safari browsers, you may need to download the latest version of the Hangouts plugin. You will need to have a Google account. Signing up for a Google account is free and you do not need to use Gmail. For information on signing up for a Google account click here. Once we have set up an appointment you should receive an email invitation from me with the link that you will need in order to meet with me online. Click on the more details link in the email. If you use Google calendar you can also open the appointment in your calendar. On the day of your appointment, please log in to your Hangout at least ten minutes before the appointment so that you can troubleshoot any problems signing in or letting Hangouts use your camera and microphone.